Most children either get a lift or walk to school with their friends and parents. But one lucky Crookfur Primary School youngster and his friends were taken to school in style aboard a party bus as part of Clyde 1’s Kool Ride to Skool competition. Leo Murphy (8), from Newton Mearns, won the fun ride by telling a joke – what is a monkey’s favourite month of the year? Ape-ril! – live on air last week. Dad Conor said: “The bus arrived at around 8am to pick up Leo and of his friends – there was 16 kids on the bus. 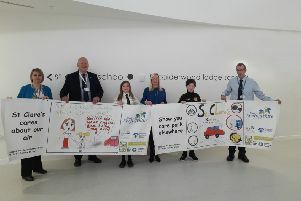 The bus then drove around Newton Mearns before arriving outside the school at just before 9am where they were greeted by pupils, teachers and parents. Conor continued: “It really was great fun and a unique thing to do. Leo was interviewed on the radio while on the bus. A Clyde 1 presenter was asking him about school, if he likes his teacher, stuff like that. So he’s actually been on the radio twice.